The decision to grant China Market Economy Status is a major inflection point in bilateral ties. Much ink has been spilled over the ongoing clash between Beijing and Brussels over the automatic recognition of China as a market economy by December 2016 according to China’s 2001 WTO accession agreement. Arguments about the dispute have tended to be either legalistic – examining the “treaty interpretation” – or technical and econometric – discussing the repercussions for EU unemployment from lower anti-dumping tariffs that would result from “Market Economy Status” (MES) for China. And while the EU must conform to international law and showcase to China that global norms are inalienable, discussion about the issue of the MES should not be seen solely as a technical operational issue but more as a pivotal strategic affair, one playing out between the world’s two largest trading blocs and two of its core political pillars. In its strategic dimension the crisis could become an unprecedented opportunity to renew efforts for a Bilateral Investment Agreement (BIT), reawaken discussion of a potential Free Trade Agreement (FTA), and include China in WTO’s procurement protocol. At the same time, a conciliatory resolution to the dispute could lead to a stronger and more integrated Europe, as political elites could focus on improving the EU’s ability to innovate, partnering with China particularly in sectors where China could offer significant knowhow like e-commerce and the Internet economy. In the 15 years since China’s accession to the WTO the flows of commerce between the EU and China have expanded substantially. Populists have used the EU’s rising trade deficit with China to accuse Beijing of mercantilism and unfair trade tactics, and call for a “fortress Europe.” To bolster their arguments they intentionally exclude reference to the EU’s record exports to China, which have created millions of jobs and promoted European welfare. 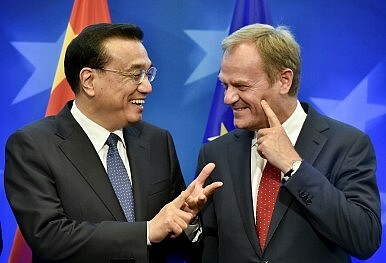 They have also declined to acknowledge China’s support for the EU during the eurozone crisis, which took the form of direct investments and portfolio investments in sovereign bonds of EU states under economic distress, as well as high-level statements by former Premier Wen Jiabao and current Premier Li Keqiang. Growing trade relations with China have benefited Europe’s GDP, but have also led to some creative destruction structurally within the EU and more importantly to net gains for some core EU nations and net losses for peripheral states. States like Germany, the U.K. and the Netherlands that have advanced capital-intensive production or competitive service sectors managed to expand their trade with China substantially, while more labor-intensive EU states saw their global market shares and GDP falter. Moreover, the EU has dramatically failed to deliver in innovation and disruptive technologies. Under the Treaty of Lisbon in 2001, the EU adopted a 2010 innovation agenda. In 2009, the EU commission realized that the goals of the 2010 agenda could not be reached, and so rescheduled them for 2020. That new day of reckoning is only four years away, and most of the EU is still far behind its goals – only Sweden running ahead. There is not a single example of China undermining the EU’s innovation efforts. To the contrary, Beijing has expanded cooperation in major research projects and shared expertise with Europe. To the detriment of the political cohesion and economic recovery of the EU, many European interest groups have looked to the United States for salvation, failing to understand that the financialization of the U.S. economy and the subsequent global financial crisis have been detrimental to European interests. The European Commission has allied with the U.S. to push the Transatlantic Trade and Investment Partnership, a mega trade pact that would limit Chinese trade competiveness in third markets, notably Africa, and pressure Beijing to conform to standards that lock in a Western advantage gained when China was comparatively weak. In addition, the EU has accepted the monopoly of U.S. Internet companies and has reacted very slowly to the erosion of Internet sovereignty that U.S. private data collection from EU Internet users has created. Very few Europeans acknowledge that China has saved the EU and the world from U.S. Internet monopoly. The MES crisis offers an inflection point in Sino-EU relations. The MES will not be resolved by technical imperative; the solution must be political and strategic. On practical terms, acknowledging the impact to the European steel industry China must agree with the EU on a special transitory period to deal with steel overcapacity in a way that does not involve dumping steel in Europe and crowding out EU producers. Perhaps China and the EU could negotiate some sector agreements for a transition period to market status, including sectors where China clearly isn’t operating according to market signals. This would be a win-win as China would promote efficiency and the EU would save jobs during an already long crisis with record unemployment. During the transitory period China’s overcapacity could be harmonized, supporting projects in developing markets in Asia with New Silk Road infrastructure initiatives while Chinese sectors become increasingly efficient and adopt market standards. As a second step and once MES has been granted, China and the EU should accelerate their BIT. The Ambassador of the EU in China, Dr. Hans Dietmar Schweisgut put it succinctly in a speech at Tsinghua University: “If we are to take our relationship forward, ‘to climb another story higher’ (‘geng shang yi ceng lou’), we have to increase market access for each other, to give our companies additional opportunities on a reciprocal basis.” This, a BIT would efficiently accomplish. Consequently, Chinese investments would be welcomed by peripheral economies in Europe, such as Greece and the countries of Eastern Europe. As Chinese investments help raise incomes in the periphery, tensions between the core and peripheral EU will ease. Of course, this will not be a panacea for the EU’s political future, but it will contribute to the EU’s integration – a central goal of long-term Chinese foreign policy, which calls for building multipolarity in world affairs. The next step should be the participation of China in the WTO government procurement agreement. If China wants to engage in infrastructure projects in the EU then EU companies should be able to compete on equal grounds for government procurement projects in China. It is a fair and reciprocal gesture that will ease trade relations considerably. Finally, the question of a free trade agreement (FTA) between the EU and China must be raised. The two sides should create a special team to prepare a feasibility study, perhaps announcing the initiative at the 2016 China-EU high summit. If Switzerland, New Zealand, Australia and Iceland – all advanced capital- and service-intensive economies – felt able to conclude an FTA with China, then surely the EU would be a fitting candidate. Certainly, an FTA would again produce many structural gains and losses within the EU. But the question of how these benefits and losses should be distributed among its states is an internal matter for the EU. It is, after all, the EU’s job to fix its internal political disharmony. It has become a cliché to cite the Chinese word 危机, with its dual meaning of “crisis” and “opportunity.” Yet a similar concept exists in the Greek-European tradition. “Crisis” derives from Ancient Greek, where it referred to distress yet also rational judgment. Make no mistake, the most rational judgment for Sino-EU relations is to overcome the obstacle of MES with a pivot to the next level of commercial and political partnership. Economic models will evolve dramatically throughout the remainder of this century as machines increasingly outperform experts, and not just blue-collar workers. In this economic environment China and the EU are not in competition – they are in fact highly complementary. The MES should not be an obstacle to market integration and good relations. Rational judgment is needed to turn this crisis into an opportunity. Shi Zhiqin is a professor of International Relations at Tsinghua University and a resident scholar at the Carnegie-Tsinghua Center for Global Policy. He is an advisor at the Tsinghua-Laskaridis Fellowship for Civilizational Dialogue.